I had a great Facebook conversation with my good friend and fellow Boydian thinker, Scott Shipman (To Be or To Do) last week and the topic of Sun Tzu and Robert Cantrell’s Strategy Card Deck came up. The cards I have had for several years now but never really tinkered with them much, until this discussion last week. My thoughts went immediately to how we cops can use them in an effort to improve our knowledge base of strategic and tactical science and improve our decision making abilities on the street. 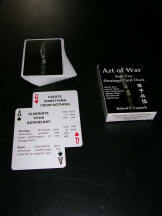 Each strategy card provides a memorable title, a strategy definition, and a basis of truth from which the strategy works. You reach your goal by enacting one or more strategies together at the same time or in a useful sequence. The strongest strategy combinations tend to have at least one representative member from each card suite. You can get a deck for around 15.00 dollars on Amazon and if you want to get the companion book Understanding Sun Tzu on the Art of War, it’s another 10.00 dollars, for a total of 25.00 bucks. Use the deck by yourself to study the ideas and how they may apply to policing or in a group setting during roll call or down time on your tour of duty, to start a discussion on strategy and tactics. They will also help you in conducting debriefs and after action reviews of incidents handled on shift. They will get you thinking about both direct and indirect ways of handling dynamic encounters. It will be money well spent on developing your skills to be a more effective and safer cop. I am going to start using them with my own guys and using them, combined with some other resources, on this blog to spur discussion. Another benefit is the deck of cards is casino grade so if playing cards is your thing you can kill two birds with one stone and take the strategy of reading people and card playing to a new level as you plan and plot your next hand! Robert Cantrell has a user’s guide on his site as well you can use to help get you started.